Volleyball block techniques for beach volleyball. Blocking is essential these days for being successful on the beach. Most teams now have specialized players. 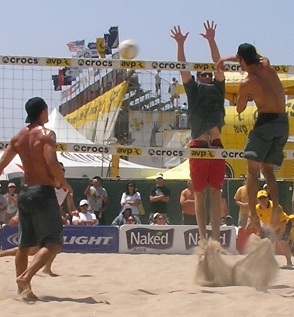 For example, in men's beach volleyball, if you're taller than 6 feet 6 inches, you likely spend most of your time blocking at the net while your partner plays defense behind you. There are many strategies to blocking on the beach. Some players like to take away the hitter's best shot, while their partner covers the rest of the court. Another big difference between indoor and sand volleyball is the fact that some teams don't attempt to block at all. With constructed beaches and hard packed sand, hitters are able to jump higher and hit harder. On the beach today, it's rare to see an attack at the net without someone attempting to block. Blocking a ball gives you a feeling of great power and confidence. Blocking your opponent's hard hit back at them is one of the greatest thrills in beach volleyball. Blocking can be one of the best ways to intimidate your opponent. After a few stuff blocks on your opponent, they'll become timid and unsure of themselves. Soon they'll start to make unforced errors and feel tremendous pressure when hitting. If you can't at least get your whole hand above the net, you probably shouldn't try to volleyball block. There's nothing wrong with not being able to block. If neither you or your partner are going to block, just serve tough, stay back, and play great defense volleyball digging and running down soft shots. This defensive strategy of not blocking is still used by many players today. When preparing to block, you want to position yourself in front of the ball. You need to watch the set and position yourself where the ball is coming down. When preparing to block, put your hands at about head height, your torso 12 to 18 inches from the net. You don't want to be too close because you could end up touching the net causing a net violation. Also, you don't want to be too far away preventing you from penetrating your hands over the net. The hitter's line of approach will give you clues to where the ball will be hit. You don't just watch the hitter. You must switch your vision from the descending ball to the hitter. All hitter's have different tendencies. Some players like to hit in the direction they are approaching. Other players like to cut the ball back in the opposite direction. If you study your opponents, you can figure out all of their tendencies and favorite shots. Paying attention to how a player hits the ball in a certain situation will make them more predictable. For example, notice how a player hits the ball when volleyball setting a ball inside, outside, low, or high. The hitter will likely resort to the same shot depending on how they are set. As you're watching the hitter and setter, stand with your knees slightly bent and feet about shoulder-width apart. As you're about to jump, crouch to get a maximum jump. Most of the time you will jump after the hitter does. The farther the hitter is from the net, the later you should jump. The hitting shoulder will dictate what direction the ball will be hit. Your volleyball block movement should be a smooth extension from your shoulders upward and forward. Reach up high pushing your hands and shoulders across the net. As you block, flex your stomach muscles (abdominals) to help penetrate the net.